My goal was to find out which combination of data flow Source and Destinations would enable me to transfer data over a network as quickly and as efficiently as possible. · And then finally I have only detailed, based on the fastest data flow items how to configure the data flow source and destinations in order to get the maximum throughput. Below is tests that I completed, each with what configurations I had configured to complete the test. · At the time, there was nothing else running on the servers, they were both idle. · Both the Source and Destination tables had compression enabled on the physical tables. 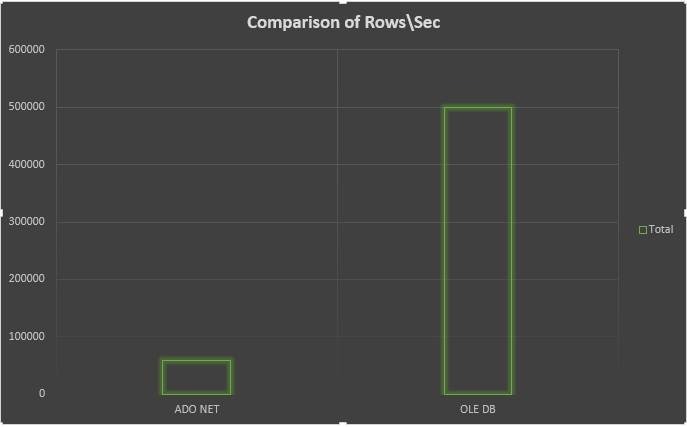 · The difference between the ADO NET source and ADO NET Destinations when compared to the OLE DB Source and OLE DB Destinations is significant. o It was just over 8 x faster. · It was interesting to note, that the network card throughput was almost 10 x faster when changing from the ADO NET to OLE DB. · So when moving large amounts of data, this would mean that data transfers can go from hours to minutes. Configuration of OLE DB Data Flow Source and Destinations for maximum throughput over a network. Below are the configuration settings for the final row in the table above. 1. The first part is to configure your OLE DB Source Connection. c. Next click on All in the left hand column. 2. Next for the OLE DB Destination you will follow all the steps in Step 1, but this will just change to your destination Server. a. NOTE: This sometimes makes the query faster, and other times it can also slow the query down. So test first. 4. 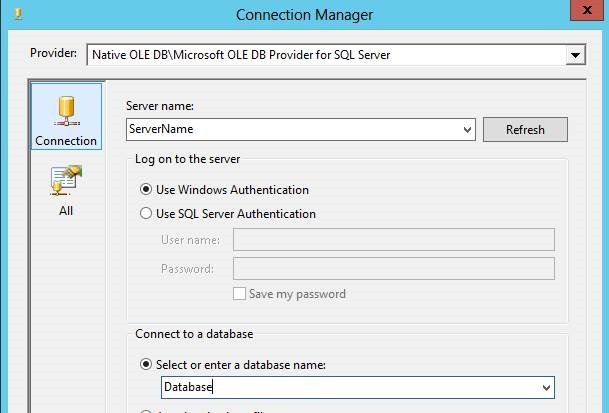 The final part is to configure the OLE DB Destination in the data flow task. a. Double click or right click on the OLE DB Destination and go into the Properties. c. NOTE: that the Maximum insert commit size is set to zero. i. You must ensure that you have enough memoryin order to only commit the entire transaction once. ii. If you do NOT have enough memory, when SSIS tries to commit the transaction, it will then fail. iii. If this happens to you, then configure the Maximum insert commit size, to accommodate your memory allocation. 1. I recently was doing a large insert of data that was roughly 640 million rows, using the above method to get the data down as quickly as possible. 2. I ran into an issue when it then had to complete the commit, which lead me to the following findings listed below. 3. When using the Maximum Insert Commit size of zero and there is not enough memory on your server, SSIS then stores this data in the TempDB. So you are not really getting the benefit of having your data stored in memory. 4. Due to the data now being transferred from the Temp DB into your working database, this once again meant that the performance was really bad. And once again due to the data not coming from the memory buffers the performance was really slow. 5. Accompanied with this is that it was now logging ever insert into your working database. So due to the fact that it was now inserting and logging every row, my Log File drive ran out of space when the log hit 340 Gb. 6. So once it failed the entire transaction rolled back. · Only use the Maximum Insert Commit size when you are inserting maybe no more than 10 million rows at a time. · If it spills over to the Temp DB the performance is really slow. · Rather if it is a large data set that you are moving rather change the Maximum Insert Commit size to a value which has the best performance for the speed in which you can insert the rows. great information! thanks for sharing…..